Poppies: Weeping Window, by artist Paul Cummins and designer Tom Piper, arrived in Wales in October as part of a UK-wide tour organised by 14 – 18 NOW, the UK’s arts programme for the First World War centenary. The attraction has welcomed nearly 100,000 visitors over a four week period. The First Minister said: “This year we remember the centenary of the Battle of the Somme, which ended on the 18th November 1916. 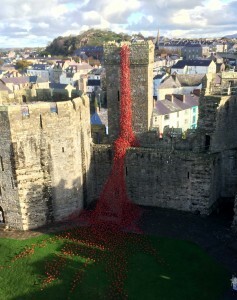 It is fitting to have the poignant and beautiful Poppies: Weeping Window here in Caernarfon at this time. “The Royal Welch Fusiliers, who fought throughout the First World War, including the Battle of the Somme, have a special link with the castle. Their museum here tells the story of the regiment including the many poets who were its members such as Hedd Wyn, Siegfried Sassoon and David Jones. “The thousands of people who have already visited the sculpture have had the opportunity to reflect and learn about how the momentous events of the First World War impacted on our communities in Wales and influenced the world we live in today. Weeping Window is one of two sculptures taken from the installation Blood Swept Lands and Seas of Red – poppies and original concept by artist Paul Cummins and installation designed by Tom Piper – by Paul Cummins Ceramics Limited in conjunction with Historic Royal Palaces. The installation was originally at HM Tower of London from August to November 2014 where 888,246 poppies were displayed, one to honour every death in the British and Colonial forces of the First World War. Weeping Window is the cascade of poppies that was seen pouring out of a high window down to the grass below. The second sculpture, Wave, is also touring the UK. The installation will be open to the public inside Caernarfon Castle daily until 20 November 2016. Morning and afternoon advance tickets are available for free online via Cadw’s Eventbrite, while an extra 1,000 people will be granted access on the door each day. For details of the full programme please see 14-18 NOW (external link). 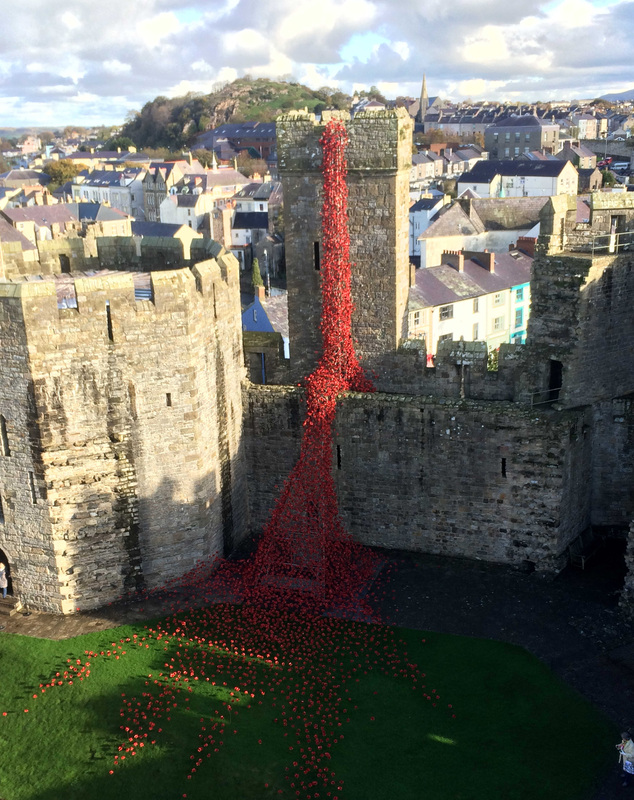 Book advance tickets (external link) to see Weeping Window at Caernarfon Castle. The Weeping Window sculpture will also return to Wales next year, to the National Assembly Building Y Senedd in Cardiff, where it will be on display from 5 August to 24 September 2017.